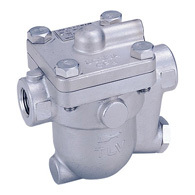 Mechanical steam traps utilize buoyancy to open and close the valve. Also known as 'Float Traps' or 'Bucket Traps'. Free Float® steam traps that offer continuous discharge and are optimal for processes. Low pressure use, up to 300 psig. Free Float® steam traps that offer continuous discharge and are optimal for processes. Mid to high pressure use, up to 1,740 psig. Some models for use in main lines also available. Free Float® steam traps for main lines that provide a tight seal even under low condensate load conditions. Large capacity steam traps with a maximum discharge capacity of 150 t/h. Free Float® steam traps for clean steam. Designed to allow complete condensate drainage and easy disassembly for cleaning. The operation principle of mechanical traps takes advantage of the difference between the specific gravities of condensate and steam. The spherical float provides an infinite number of contact surfaces with the valve seat, ensuring long service life. Air venting feature for improved equipment productivity. Compact design with no levers or hinges. Large tolerance for backpressure allows for problem-free operation even where condensate is recovered. Mechanical traps are suitable for use in a variety of applications, including steam main lines, heat exchangers, and insulation applications such as tracers. TLV CORPORATION is a proud member of the Fluid Controls Institute (FCI), a non-profit association of fluid control equipment manufacturers. FCI has distinguished itself in the technical advancement of the fluid control industry through the development of standards to promote the production of higher quality, more useful products.